The Arts Center of Cannon County and The Tennessee Sampler Survey are pleased to announce the opening of the TRAVELING EXHIBIT OF TENNESSEE EMBROIDERY SAMPLERS. The unique exhibit will be on view at the Arts Center of Cannon County, Woodbury, TN, from Friday, December 2nd, 2011 to Friday, December 23rd 2011. The exhibit will subsequently tour the state, traveling to the McMinn County Living Heritage Museum (Athens) and the Etowah Arts Commission. Middle Tennessee was a center for female education in the 19th century. Young women from all over the country sought out a classical education here. Besides learning music, poetry, orthography (spelling), and moral religion, needlework was a major part of their studies. 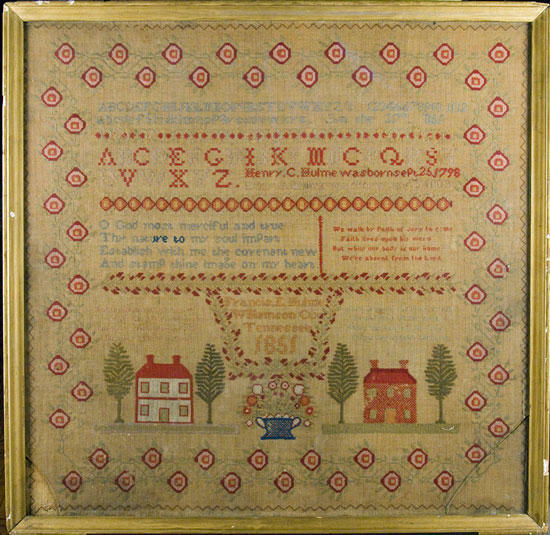 The greatest legacy of their work is in the fine needlework samplers that remain today. Many of which have been passed down through family members. Since 2004, the Tennessee Sampler Survey has been documenting 19th century embroidery. Twenty Tennessee samplers were selected for the exhibit, each from a different county. The exhibit presents the samplers on full-sized panels; the actual samplers are not part of this exhibit due to their fragility. Five text panels, explaining the work of the Tennessee Sampler Survey and the regional characteristics of the samplers, are also part of the exhibit. The Marly Berger Gallery located in the Arts Center of Cannon County will host this exhibit Dec. 2nd through December 23rd. Admission is free and the gallery is open from 10:00 AM to 4:00 PM, Monday through Saturday. The Arts Center is located at 1424 John Bragg Highway, Woodbury, TN 37190. For more information call (615) 563-2787 or (800) 235-9073, email evan@artscenterofcc.com, or visit www.artscenterofcc.com. This exhibit is funded in part by the Tennessee Arts Commission, CBRL Group Foundation, and the LifeWorks Foundation. It is great to know that the Arts Center is more than just putting on performances. As a Graphic Designer I feel this is a worth while field trip for our students in this county, especially art students.